Anyone who has ever set foot in Mount Carmel knows that it is a coal town, and has been since the 1862, when the borough was incorporated. 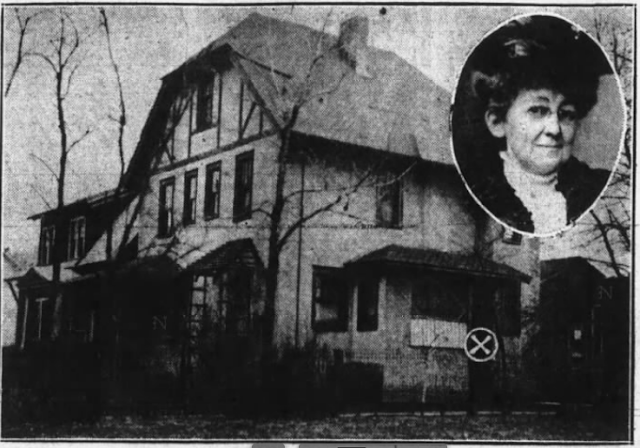 By the time the Reliance Colliery was established in 1896 by Thomas Baumgardner, nearly 13,000 people called Mount Carmel home, and virtually all of them had family members who worked in the mines. But many people with roots in the area would be surprised to learn that is that there was another major industry that competed with coal back in those early days: brick manufacturing. The center of local brick manufacturing was located just west of the borough, in present-day Connorsville and Beaverdale. Back then, during the late 19th century, Beaverdale was little more than a farm owned by Patsy Donlan and Connersville was just a field ostensibly owned by a guy named Connors. 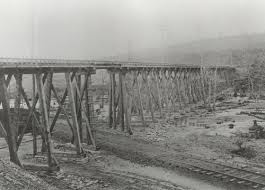 Several brickyards were located at the upper portion of these tracts of land, along Shamokin Creek, about a quarter mile west of where the viaduct now stands. Since the days of the Indians it had been known that the clay dug from the bed of Shamokin Creek was of exceptional quality, and in Mount Carmel's early history scores of men earned their living by harvesting this clay. The most significant of these brickyards was owned by John Coyle, an early settler of the area who later became active in local government. His plant employed a half dozen workers who dug the creekbed to a depth of more than forty feet to obtain the clay. Brickmaking was done the "old-fashioned" way at the Coyle plant, with the clay being pressed into wooden molds and fired in a kiln. Each brick was essentially hand-made, which meant that only small quantities could be produced. Mount Carmel's other leading brickmaker was John Christopher, whose plant was situated near the Beaverdale shaft of the Philadelphia and Reading Coal and Iron Company. Christopher's men dug clay and loaded it onto small-guage rail cars, which then carried the clay to the plant where it was placed into mixers and then into molds. As the mining industry continued to flourish, Mount Carmel's brickmaking industry began to struggle, however. Culm from coal mining operations upstream settled at the bottom of the creek, burying the valuable clay beneath several inches of debris. In 1895, Coyle and Christopher sold their plants to the Union Brick Company of Tharptown. The Reliance Colliery, which would usher in a new era of industry for the borough and its residents, would open one year later. By 1903, the Union Brick Company had evolved to hydraulic presses, iron molds and other modernized methods and equipment to produce 50,000 bricks per day. The Union Brick Company maintained two plants in Tharptown. One plant specialized in pressed brick and had the capacity to produce 20,000 bricks per day. The other plant manufactured bricks of the common red variety and had the capacity to produce 30,000 bricks per day. These two plants were situated next to each other on 32 acres of land and employed approximately 40 full-time workers. Since the Union Brick Company and other newer plants could easily produce more bricks in a day than both Mount Carmel brickmakers could produce in a month, the ancient art of making bricks by hand began to die out. 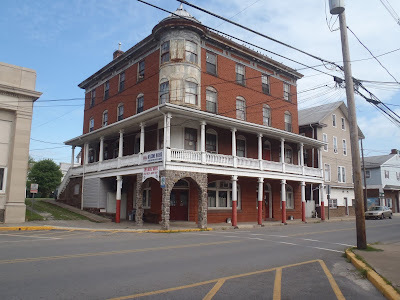 Yet, amazingly, there is one building in town still standing that was built from John Coyne's original 19th century hand-made bricks. 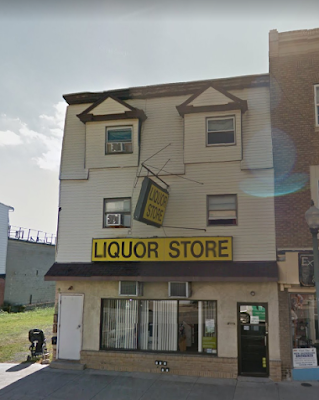 This building can be found at 136 South Oak Street, which is now a liquor store. Some of the borough's older residents may recall that this building, from 1903 to 1936, was the site of the Joseph T. Liachowitz jewelry store (not to be confused with the Liachowitz jewelry store in Shamokin. This building, which was owned by Joseph's brother, was located at 518 North Shamokin Street. Built in 1923, the copper, glass and marble-faced structure was a downtown Shamokin landmark for many years, but was partially destroyed by fire in 1932). 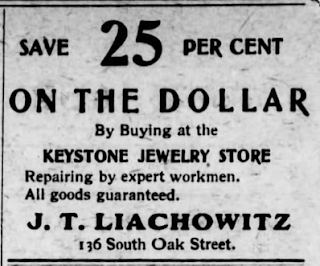 The Joseph T. Liachowitz jewelry store on South Oak Street became a meat market in 1937. During the 1940s, it was the home of Eppie's Dress Shop. Up until a few years ago there was another building on South Oak Street that had also been constructed with John Coyle's hand-made bricks. This building was located at 142 South Oak and was, for many years, the home of Levine's Department Store. This historic building was destroyed by fire in January of 2006, abandoned, and later condemned. It was torn down in 2008. With only one structure still standing built with hand-made bricks made from clay dug from Shamokin Creek by John Coyle's men more than a century ago, let's hope that this last remnant of Mount Carmel's bygone brickmaking industry continues to stand for years to come.